LAKEWOOD, CO, Feb. 12, 2019 /CNW/ – Energy Fuels Inc. (NYSE American: UUUU; TSX: EFR) (“Energy Fuels” or the “Company”), a leading producer of uranium and vanadium in the United States, is pleased to announce that it is now producing high-purity vanadium at commercial rates of approximately 175,000 to 200,000 pounds of V2O5 per month and that shipments of vanadium have commenced for sale to customers. Ramp-up is expected to continue in the coming weeks, and the Company continues to expect to reach full production rates of 200,000 to 225,000 pounds of high-purity V2O5 per month by the end of Q1-2019 or sooner. As previously announced, Energy Fuels recently commenced a campaign to recover vanadium pentoxide (“V2O5“) from existing tailings pond solutions at its 100%-owned White Mesa Mill (the “Mill”). During January 2019, the Company continued to ramp-up vanadium production, including achieving increasingly higher production rates, purities, and the completion of further process refinements and optimization. The Company is further pleased to announce that it has begun vanadium shipments, with initial quantities being allocated for conversion to ferrovanadium that will be sold into spot metallurgical markets. The Company expects to continue to sell finished vanadium product into the metallurgical industry, as well as other markets that demand a higher purity product, including the aerospace, chemical, and potentially the vanadium battery industry. The Company expects to sell to a diverse group of customers in order to and maximize revenues and profits. Vanadium markets have strengthened during 2019, following short-term softening observed in late-December 2018. The year-end 2018 mid-point spot price of V2O5 in Europe, as reported by Metal Bulletin, was $15.50 per pound of V2O5, while the current reported price is $17.25 per pound of V2O5âan increase of approximately 11%. The Company believes that the basic market fundamentals that led to the price increases observed in 2018 have not changed, including significant production cuts in China for pollution control and new specifications for rebar in China that mandate increased vanadium content. The Company believes that these basic market fundamentals should support today’s high price levels for the foreseeable future. In addition, the Company’s previously announced test mining campaign targeting vanadium at the La Sal Complex is proceeding well. The Company expects to update markets on this program in the coming weeks. About Energy Fuels: Energy Fuels is a leading US-based uranium mining company, supplying U3O8 to major nuclear utilities. The Company also produces vanadium from certain of its projects, as market conditions warrant. Its corporate offices are in Denver, Colorado, and all of its assets and employees are in the United States. Energy Fuels holds three of America’s key uranium production centers, the White Mesa Mill in Utah, the Nichols Ranch ISR Project in Wyoming, and the Alta Mesa ISR Project in Texas. The White Mesa Mill is the only conventional uranium mill operating in the U.S. today, has a licensed capacity of over 8 million pounds of U3O8 per year, and has the ability to produce vanadium when market conditions warrant. The Nichols Ranch ISR Project is in operation and has a licensed capacity of 2 million pounds of U3O8 per year. The Alta Mesa ISR Project is currently on care and maintenance. In addition to the above production facilities, Energy Fuels also has one of the largest NI 43-101 compliant uranium resource portfolios in the U.S., and several uranium and uranium/vanadium mining projects on standby and in various stages of permitting and development. The primary trading market for Energy Fuels’ common shares is the NYSE American under the trading symbol “UUUU”, and the Company’s common shares are also listed on the Toronto Stock Exchange under the trading symbol “EFR”. 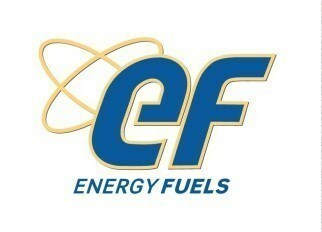 Energy Fuels’ website is www.energyfuels.com. Cautionary Note Regarding Forward-Looking Statements: Certain information contained in this news release, including any information relating to: the Company being a leading producer of uranium and vanadium in the U.S.; any expectations about expected pounds of vanadium that may be recovered at the White Mesa Mill including current rates of 175,000 to 200,000 pounds of V2O5 per month and/or full production rates of 200,000 to 225,000 pounds of V2O5 per month in the future; any total amount of vanadium expected to be recovered from the Mill’s pond solutions, and the product quality or purity of such current or future recovered vanadium; any expectations relating to the continued successful ramp-up of the Mill pond vanadium recovery campaign; any expectations regarding the Company’s expected margins, sales strategy, and/or ability to maximize profits on vanadium, including conversion to ferrovanadium for sale into the metallurgical market and/or sales into the aerospace, chemical or energy storage industries; any expectations regarding current and/or future vanadium markets, including whether current vanadium prices may continue to support production; any expectations regarding the test mining program at the La Sal Complex; and any other statements regarding Energy Fuels’ future expectations, beliefs, goals or prospects; constitute forward-looking information within the meaning of applicable securities legislation (collectively, “forward-looking statements”). All statements in this news release that are not statements of historical fact (including statements containing the words “expects”, “does not expect”, “plans”, “anticipates”, “does not anticipate”, “believes”, “intends”, “estimates”, “projects”, “potential”, “scheduled”, “forecast”, “budget” and similar expressions) should be considered forward-looking statements. All such forward-looking statements are subject to important risk factors and uncertainties, many of which are beyond Energy Fuels’ ability to control or predict. A number of important factors could cause actual results or events to differ materially from those indicated or implied by such forward-looking statements, including without limitation factors relating to: the Company being a leading producer of uranium and vanadium in the U.S.; any expectations about expected pounds of vanadium that may be recovered at the White Mesa Mill including current rates of 175,000 to 200,000 pounds of V2O5 per month and/or full production rates of 200,000 to 225,000 pounds of V2O5 per month in the future; any total amount of vanadium expected to be recovered from the Mill’s pond solutions, and the product quality or purity of such current or future recovered vanadium; any expectations relating to the continued successful ramp-up of the Mill pond vanadium recovery campaign; any expectations regarding the Company’s expected margins, sales strategy, and/or ability to maximize profits on vanadium, including conversion to ferrovanadium for sale into the metallurgical market and/or sales into the aerospace, chemical or energy storage industries; any expectations regarding current and/or future vanadium markets, including whether current vanadium prices may continue to support production; any expectations regarding the test mining program at the La Sal Complex; and other risk factors as described in Energy Fuels’ most recent annual report on Form 10-K and quarterly financial reports. Energy Fuels assumes no obligation to update the information in this communication, except as otherwise required by law. Additional information identifying risks and uncertainties is contained in Energy Fuels’ filings with the various securities commissions which are available online at www.sec.gov and www.sedar.com. Forward-looking statements are provided for the purpose of providing information about the current expectations, beliefs and plans of the management of Energy Fuels relating to the future. Readers are cautioned that such statements may not be appropriate for other purposes. Readers are also cautioned not to place undue reliance on these forward-looking statements, that speak only as of the date hereof.